Intelligent Service Robotics fosters the dissemination of new discoveries and novel technologies that advance the ability of robotics to assist and support humans. 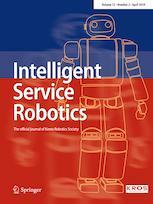 The journal addresses a broad spectrum of topics ranging from intelligent robots acting as a servant, secretary, or companion to intelligent robotic functions such as embedded robotics, ambient intelligence, or intelligent space. Special attention is given to the integration of robotics with information technology and cognitive science, with the goal of developing new multi-dimensional robotic services. This includes ubiquitous and adaptive computing, information integration in a distributed environment, and cognitive modeling for human-robot interaction.